A great gift item for any pilot. Features quartz alarm clock movement in a high impact Polystyrene case measuring 6.5" x 6.5" with a glass lens. Requires one AA battery. Just like the real thing only bigger! 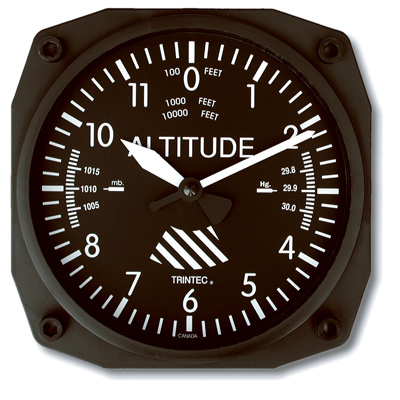 Review: My pilot husband was very impressed with his altimeter wall clock. Its perfect for his desk in the study and he was very pleased with the quality. Review: So neat and worth it to buy! Review: No complaints. Good looking and keeps accurate time. Good addition to my study. Review: We are giving it as a gift to a new pilot. Pros: It was fair priced. Review: I liked the size of the clock but thought it should have a second hand. Seeing I'm not pilot, does a altimeter gauge have a second hand ? I purchased the clock, as a small gift, for someone who had received their pilot license . Also, I liked you could hang or set the clock on a flat surface. It keeps pretty good time. Another pilot recommended the clock, she had received one many years ago. I would recommend this clock. It is a perfect clock for a pilot. Every pilot needs to have one. Very unique. Pros: Perfect representation of an altimeter that gives you the time. Review: I always wanted one. Now it's hanging on my wall.Thank you for making this possible! Q: Are the four screws on the corners just decorative or can they be used in mounting the clock? A: Those are just for decoration. Q: How big is this clock? A: This clock measures 6.5" x 6.5".